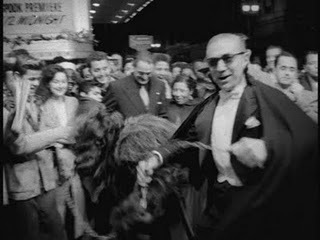 Sporting a pair of Ray-bans and leading gorilla-suited actor Steve Calvert on a chain, Bela Lugosi made a personal appearance at the premiere of The House of Wax at the Paramount Theater on April 16, 1953. Inevitably dressed in his Dracula costume, hi appearance was intended to create publicity for The Atomic Monster, a proposed vehicle for Lugosi, which scriptwriter Alex Gordon was trying to persuade Allied Artist to greenlight. The script was eventually filmed by Ed Wood under the title of Bride of the Atom/Monster. Lugosi was interviewed for TV by Shirley Thomas. Due to his deteriorating hearing he memorized the questions and his answers in advance. On the night, however, Thomas, who is said to have misplaced her list of questions, asked them in a different order. As a result of the hustle and bustle of the crowd, it is claimed that Lugosi didn’t realise and answered them in the original order. 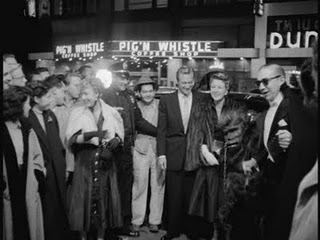 Although no footage of the interview with Shirley Thomas appears to have survived, Bela Lugosi’s arrival at the premiere was captured on film by Warner’s Pathe Newsreel. 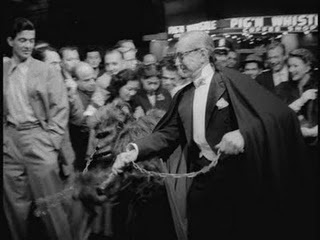 You can read more about Bela Lugosi’s appearance at the Paramount Theater in our Bela Lugosi At The House Of Wax Premiere article.